This morning I was up early and ready for breakfast by 7am. Breakfast is served in the Saga Hall Restaurant located on deck 5, it generally opens at 7am and closes at 10am. It’s a nice big, bright restaurant with plenty of tables for 2, 4, and 6. Breakfast and lunch are both buffet style with a fantastic choice. For breakfast we had cereals, fruit, yoghurt, cheese, ham, smoked salmon, toast, pancakes, eggs, bacon, beans and more. The one thing I did miss was not having an omelette station or pastries on offer but I by no means went hungry! Tea, coffee, apple and orange juice are included at breakfast. Service was good and the restaurant never felt overcrowded, even though the ship was full. The food was fresh and regularly being replenished. After breakfast we arrived in Harstad. I was straight off the ship and onto the coach for my excursion ’A taste of Vesteralen’, this lasted approximately 4 hours and took in some stunning scenery. Firstly we stopped off at a lovely little church on the bank of the Fjords for a quick service. After this we stopped off at a museum within an old Army Bunker. Our guide gave us some background information on the area and a guided tour of the museum. The remainder of the excursion was a scenic drive along the fjords, this was the best part of the excursion for me as it was just stunning. The sun was shining and reflecting on the fjords, everything was covered in fresh snow as far as the eye could see. We drove past wild Elk and picturesque little wooden cabins on the side of the waterbank. After our tour we re-joined the ship in Sortland for lunch. 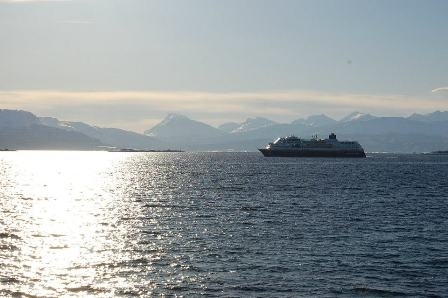 We would soon be on our way to Stokmarknes. As I mentioned above, lunch is buffet style and served between 12 noon - 2pm. Everything I had was delicious, plenty of choice, lots of salad, cold cuts of meat, cheese, roasted vegetables, pasta, fish cakes, cod, mackerel and herring, along with beef and meatloaf. If you have a sweet tooth like me you’ll be in heaven as there’s just as much choice when it comes to pudding! By the time we finished lunch we were in Stokmarknes where we disembarked to have a look around the Hurtigruten Museum. Entrance into the museum is free if you’re travelling onboard a Hurtigruten ship, and is worth having a look around. The museum gives you an insight into how life use to be like onboard, with artefacts on display, photographs and models of past ships. Attached to the museum is the MS Finmarken, the ship entered service in 1950’s and was withdrawn in 1993. 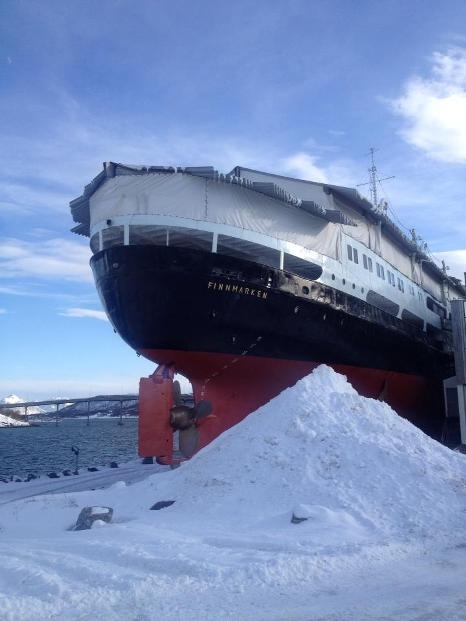 In 1994 it was given to the Hurtigruten Museum then pulled ashore in 1999 and connected to the museum by a walkway. It was fascinating to walk around the ship and see what it use to be like. I couldn’t get over how dated it was considering it only came out of service 20 years ago. It really highlights how ships have come on over the years. After this whistle stop tour we were back on board our ship and heading for Scolvaer. This was the first chance I actually had to have a look around and enjoy the beautiful scenery we were passing. The 16,140 gross tonnage ship was built in 2002 and can hold up to 822 passengers and 45 cars. The accommodation I stayed in was rather basic, but as you can gather from my blog so far, I’m spending very little time in my cabin. All accommodation has en-suite facilities and European plug sockets. The storage space was enough for me on a short cruise but in the lower grades I think guests would struggle to fit all of their bulky cold weather clothes in. I would definitely recommend looking at the mid to higher grades of accommodation if you’re onboard for a 7 night trip, purely to benefit from additional space. The public areas around the ship are very comfortable, as you walk around you very rarely miss any of the passing scenery as it has lots of floor to ceiling windows throughout. The Panorama Lounge on deck 8 is split level and offers fantastic views, as does the Fjord and Saga Bar also on deck 8. In these two bars you can pick up complimentary wifi which I’m using a lot. The ship has a small internet cafe and library, along with an information centre where you can gather details on the area you’re visiting, daily programmes and excursion. Despite the very cold temperatures whilst we’re sailing, I was drawn outside by the beautiful scenery. Before heading out today I made sure I was wrapped up so I could enjoy it all. Whilst I was outside we sailed past the mouth of the Trollfjord. 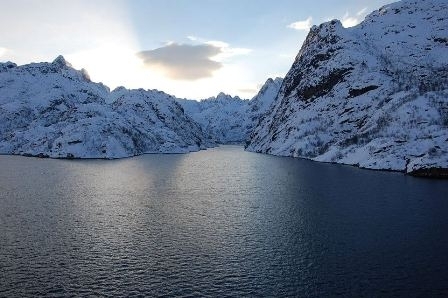 Unfortunately as we were cruising in winter it was too dangerous to go down the Trollfjord in case there was an avalanche but in the summer they do manage to get in. After taking far too many pictures of the same thing I decided to head back into the warm for a nice hot chocolate before we arrived in Svolvaer. On arrival my group and I stepped off the ship and within 100 yards was the Magic Ice Bar, how convenient. We entered the bar and wandered around the magical ice sculptures that were glowing in the candlelight and lit with colours similar to the Aurora Borealis. The drinks in here were served in 100% carved ice glasses. After this little tipple we headed back to our ship for dinner. Dinner onboard is a set menu served in the Saga Hall. Tonight we had a delicious warming soup for starters, followed by haddock for main and a rhubarb crumble for dessert. So far I’m really impressed with the cuisine onboard, every meal I’ve had has tasted fresh, full of flavour and presented well. After dinner we headed to the bar where a pianist was playing and taking requests. This was enjoyable but as the Northern Lights didn’t make an appearance last night we were all hoping to see them tonight... we were in luck. As we were sitting listening to the pianist play we got wind that the lights were beginning to emerge. I rushed out on deck and couldn’t believe my eyes. There they were. 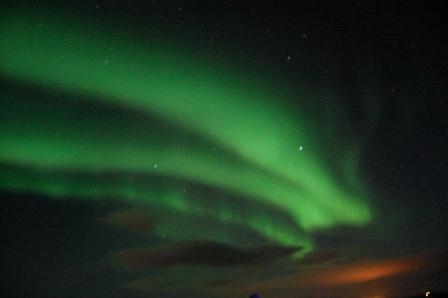 I was sailing down the Norwegian Fjords looking up at the Northern Lights. 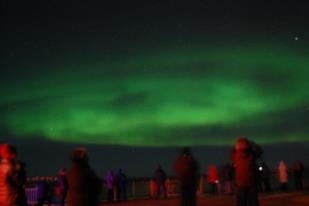 It was magical and the atmosphere out on deck was wonderful. Everyone staring up at the sky with huge smiles on their faces. The lights faded in and out and were constantly changing. I stayed out for as long as I could but in the end the cold got the better of me. Off to bed I went hoping that I’d see the same the following night. Click here to view Day 3 and here if you missed Day 1.